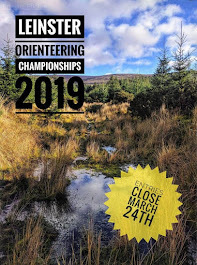 Next Sunday 8th March we are holding the 9th event of the Leinster League event in Oughaval Wood, Stradbally, Co. Laois. Yellow: 2.0 km 60m climb. This is on the northwest side of the N80 Carlow-Port Laoise road almost 2 km south of Stradbally village, and about 10 mins from the M7 at Port Laoise. Registration, Start and Finish will all be close by. We will be using SI timing. SI timing chips will be available to hire – cost €1 each. Entry on the day - no pre-registration - but we will have fast-track entry system for anyone whose SI details are in the IOA archive - see explanation below. There are many recently fallen trees in the forest, only the very significant ones are shown on the map. New Entry System is described HERE. Please read!!!!!! Tue 23 June Hollywood including barbecue.